OCat grues, L. Grus grus, MEng cranys, Eng. cranes. 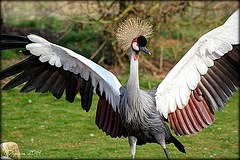 Avenzoar states that cranes are hot, dry and are digested slowly. Their fat is useful for illnesses caused by cold but this property is more pronounced in the domestic and wild duck. Cranes, peacocks, geese and ducks are recommended for those suffering from prostration and hemiplegia, but they are harmful for people of a warm nature. They are digested with difficulty, especially during the summer season. By the 10th C at least they were numerous in León and raised especially in villages near the capital to be sold in the market there. Hispano Muslims thought well of cranes. Like other birds, they hung dead cranes for a few hours before preparing them to facilitate digestion. Step 1: Remove the eggs from the refrigerator and let sit for them to be room temperature before pouching. Quarter a crane and put in a pot. Put the onion in a food processor and mash it. Pour this over the crane. Add all other ingredients other in step 1. Cover with water and bring to a boil. Reduce heat and gently boil until done, about 20 minutes. Remove the meat and debone it. Set the pot aside saving the liquid. Step 2: Fry the meat in olive oil until browned. This Really Beats Kentucky Fried Chicken! Step 3: Put it back into the pot and cook until all the water evaporates. 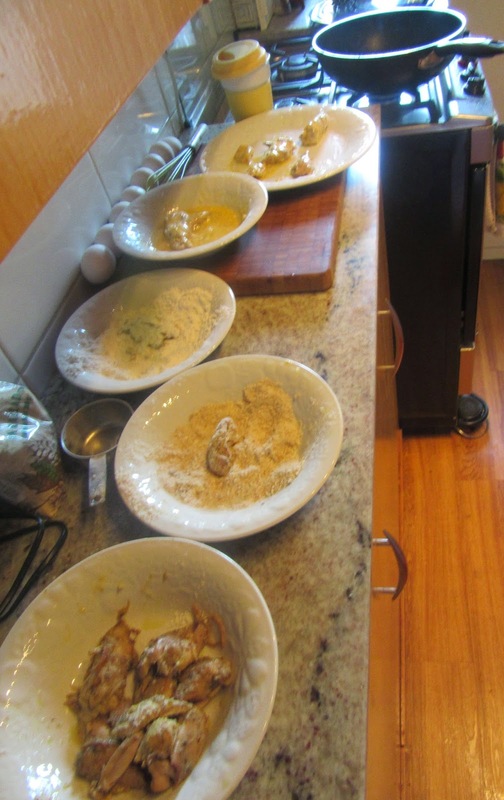 Step 4: Cover the meat in flour and breadcrumbs. Dip it into a raw egg slightly beaten. Fry again. When browned put the pieces on a serving platter. Step 5: Carck eggs. Separate the yolk from the whites. Pouch egg yolks and dot the platter with them. Sprinkle with rue. Se corta una grulla adulta y se le echan especias, pimienta, canela, cebolla majada con sal, hojas de cidra y brotes de hinojo, vinagre, según su fuerza y también almorí, según la fuerza de su negrura, aceite, agua, un brote de tomillo y ramas de ruda; se cuece hasta que esté en sazón, se saca la carne y se fríe en aceite hasta que se tueste; entonces se vuelve a la olla y se cuece hasta que desaparece el agua; luego se le da cuerpo con harina blanca, migas ralladas [p. 53 y huevos; se le pone encima yemas y cuando saca, se corta sobre ello ruda y se hiervan las yemas se adorna y se presenta, si Dios quiere. Cut up an adult crane, and throw in spices, pepper, cinnamon, onion scraped with salt, citron leaves, stalks of fennel, vinegar according to its strength, and likewise murri according to the degree of its blackness, enough oil and water, and "eyes" of thyme and sprigs of rue. Cook until done, take out the meat and fry it in oil until it is browned, then return it to a pot and cook it until the water disappears. 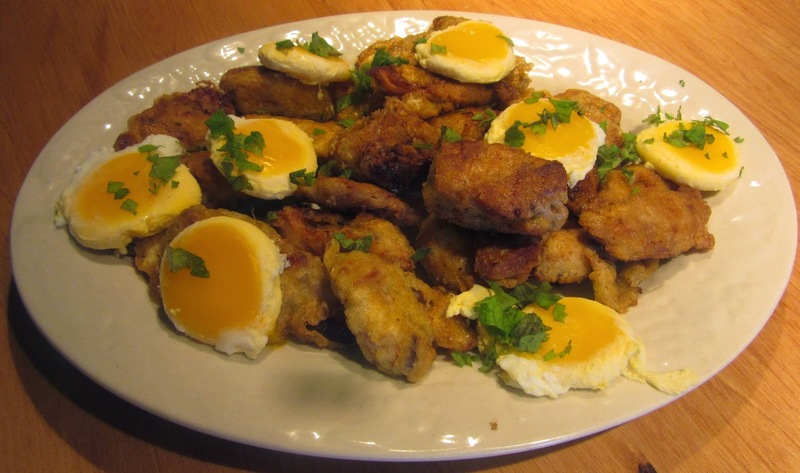 Then cover the contents of the pot with white flour, grated breadcrumbs and eggs. 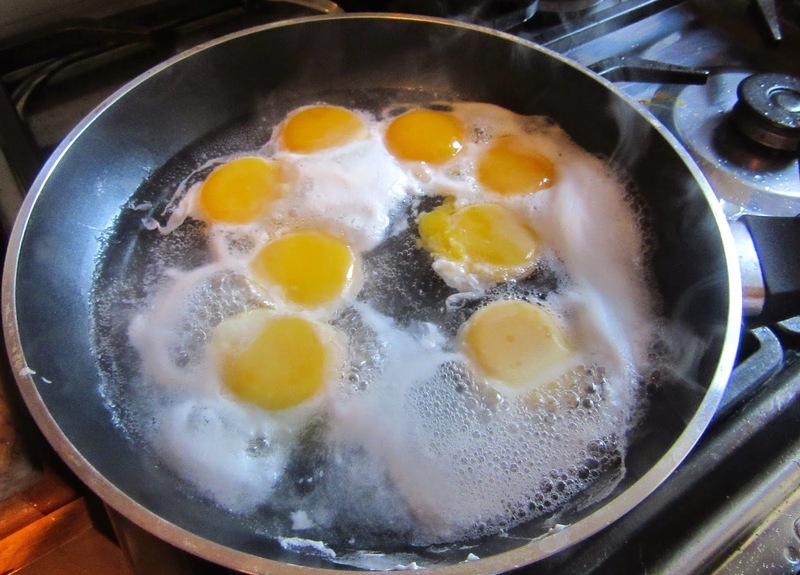 Dot it with eggyolks and when you ladle it out, cut rue over it, boil eggyolks, garnish it, and present it, God willing. As the Medieval Spanish Chef’s game warden was on strike and half of a fat hen was used. Chopped mint leaves were used as the rue has been sprayed with insecticide.